Today we have the final Edel recap. It contains off key karaoke, the swamp fox bar, no running water in the hotel and possibly the worst dance hair known to mankind. Friday night was the fabulous Crazy Shoe and Cocktail party. I wore my best sparklers. Many who attended actually created new shoes. Susan did a great job here sharing all the awesomeness. I did not have the creative energy for that so I just dug into my closet and decided to look like I was wearing disco balls on my feet. Kelly had the same idea. There were fabulous ‘hors de vours, including shrimp and grits, to nibble on as I made my way around the room sipping a lovely little cocktail called the Edel. Sweet Tea Vodka, we meet again. Oh what good friends we are becoming. There were so many people. So much love and laughter in one room. So many spectacular shoes. It was a little slice of heaven. 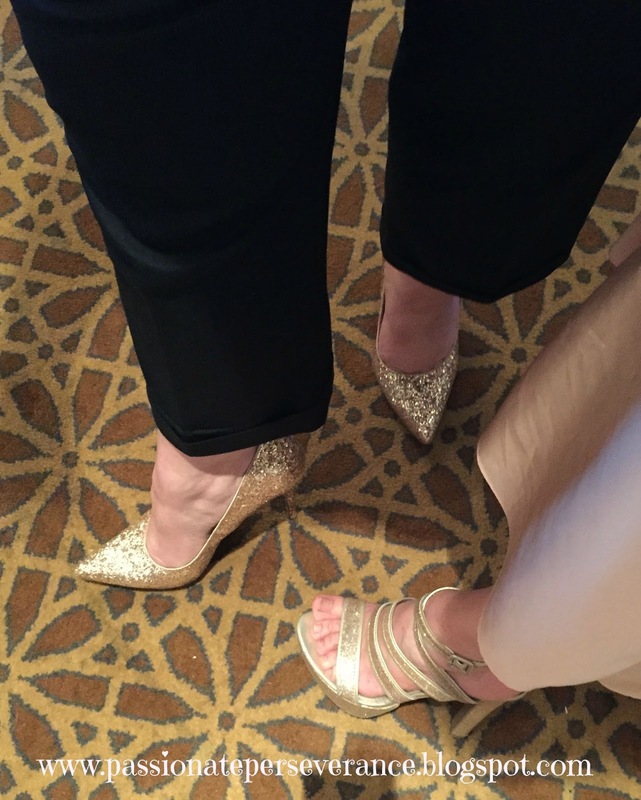 I started in one corner of the ballroom and slowly made my way through a flood of small groupings of fabulously attired women, their babies, their pregnant bellies and simply stunning shoes. Hugs, laughter, nibbles on yummy apps, sipping on a lovely cocktails, rinse and repeat, rinse and repeat. After and hour in five inch heals, I stole away to a corner and found a spot to hang my shingle and I took off shoes and chatted the evening away. This was what I had come for, to meet my peeps, fellow Catholic women who were in the trenches with me. Raising kids, empty nesters, maybe single discerning their future’s or divorced and working through things, you name it, they were there. It was an honor and a privilege to listen to each of their stories and really hear what what on their hearts. Oh my sweet Edel peeps. You have no idea how you changed my world in just a few hours. God had been preparing me for such a time as this and I was all in. After the festivities for the evening wrapped up, a gaggle of us headed next door to the Swamp Fox Bar. What a cool name for a bar, right? Anyhoo, there may have been a sweet tea martini, shaken not stirred, waiting for me as an awesome group of women continued chatting and sharing our stories. It reminded me of my days as a Navy wife at the O Club on a Friday night. Have I mentioned that when a menopausal woman drinks, the hot flashes come more frequently? Humidity + hot flashes = Mary didn’t stand a chance. I only had one cocktail in the bar (I may or may not have had another at the cocktail party. I can neither confirm nor deny) but it was enough to bring the torrent of sweat that happens 3.2 seconds after the internal volcano erupts. I decided to call it a night and head back to my room for a nice cool shower. At this point I learned the ugly truth that had been batted about all day among the hotel quests. There was no running water in the hotel rooms. A pump had blown and the hotel was doing it’s best to get it fixed ASAP. I didn’t really panic at that moment. I just got into bed and decided I would worry about it in the morning. I got up at 8 a.m. the next morning to find the situation had not been resolved. Seriously? 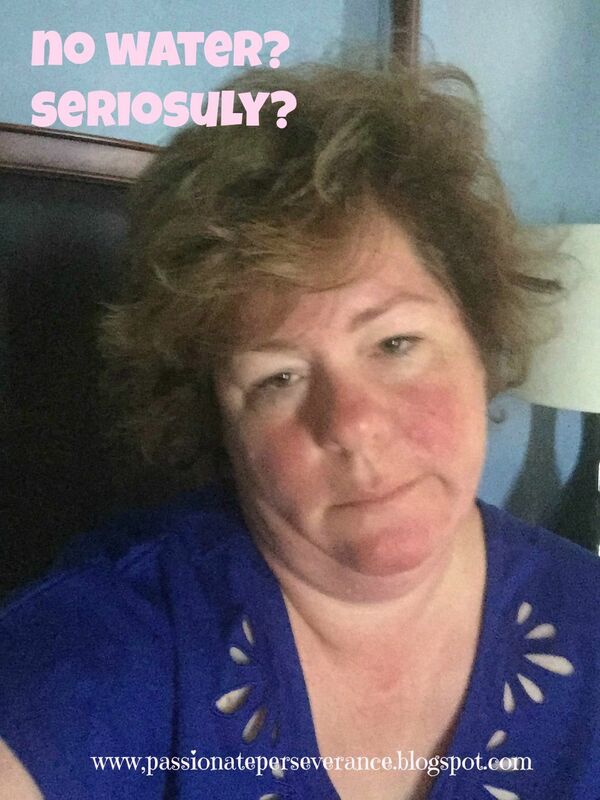 No water with 300 breast feeding, menopausal, pilates stretching, Battery Park running, Charleston city walking women in July, in South Carolina?? No bueno my friends. Shut.It.Down. This was disaster of monumental proportions. Thankfully the hotel restaurant had running water and a fully working kitchen. So I did something I have NEVER done before in my lifetime. Isn’t that what celebrities do? They order room service. So for $20 (including tip) I got a pot of hot coffee, grits, eggs, bacon, fruit and toast. Best $20 bucks I ever spent. AND I got to eat it in bed!! I mean who does that?? Apparently I do, or rather, I did that Saturday morning. By the time I finished, I had running water in the sink. So I brushed out my hair as best I could, curled what I could to at least get rid of some of the frizz and took a good old fashioned sponge bath. After five layers of deodorant and fourteen layers of body powder, I was ready to face the day. We were all feeling the heat, literally and there were many very interesting hair styles that morning. At least we were all in it together. Sisters with greasy hair unite!! Saturday included three fabulous talks. First up was Rachel Balducci. I had the privilege of meeting her earlier this year at another event. This woman is awesoemsauce. Funny, real and always striving for holiness. Best line of her talk “Love the season you’re in.” That just broke it open for me. I mean how am I supposed to love this season of grieving and sadness without my girl? Well, one way was attending this gathering, another is trusting the Lord to carry this cross of grief for me. Talking about Courtney helps me. I was encouraged to do that this past weekend and it was such a heart healing experience. Next up was Kelly Mantoan from This AIn’t the Lyceum. Kelly is the Mama of two special needs kids and she spoke from her gut. I was blow away by her honesty. By the end of her talk I was in tears. This Mama and I, we have followed similar paths and when God gave us our sweet kids, it flipped our lives upside down. One day Kelly will face what Jerry and I have faced times two. I just can’t even imagine. I had the opportunity to chat with her later that evening and I told her how proud I was of her. She laughed and said of all the people in the audience, she knew I would “get it”. Oh I do siter. I do. I can’t wait to see where God leads you in this new ministry of yours. I think He has BIG plans for you girlsfriend. BIG PLANS! I had found laughter again. Joy again. Edel gave me that. 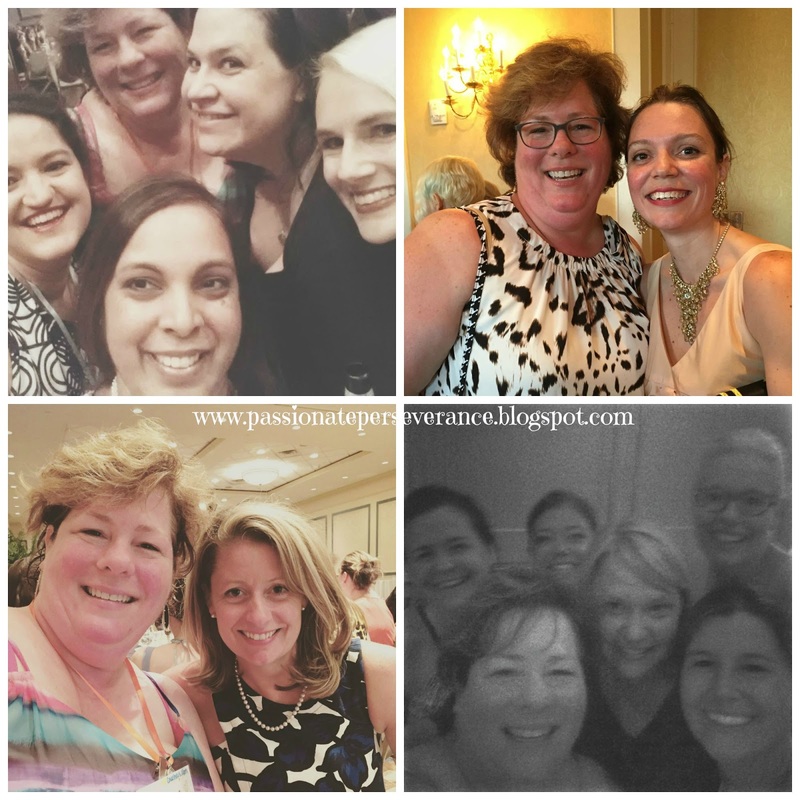 I found authentic womanhood and got to revel in it. I mean where can you find the Adoration Chapel upstairs and the bar downstairs? No the irony of location is not lost on me. After a quick change for dinner, I had the privilege of giving thanks and praying the blessing before dinner. So very honored to be asked to do so. Then Audrey Assad gave the dinner keynote. I have loved her music since her first single. I was privileged to share a moment with her before dinner where I got to share with her how her CD “O Happy Fault” was the background music for the last nine months of Courtney’s life. Her music, with it’s calming melodies and hauntingly beautiful lyrics, sang my girl home to Jesus. It was a very special moment for me and I thank God for it. After dinner, the insanity began. Edel is famous for the dancing/karaoke portion of the evening. EVERYONE dances, introvert, extrovert, happy or sad. At one point or another, everyone makes their way to the floor. Kelly is know for her rapping ability and does an awesome robot move. I know the video is dark but it is quite spectacular. Kelly, I bow to your expertise. You are so on fleek. FloRida ain’t got nothin on you! Video Jul 11 from Mary Lenaburg on Vimeo. I just realized I mislabeled the videos so don’t pay attention to that. My bad. After a few more lovely ladies got up and did their thing, my name was called. I had been practicing for months knowing this moment would come at Edel. I took a deep breath and promptly forgot every singel freaking word to Meghan Trainor’s “All ABout “da Bass”. You can tell. I am off key, totally lost most of the time, and trying not to say the two curse words as not to offend anyone. However, I threw myself into the moment and gave it my all. Oh Lordy I don’t think the ladies of Edel were ready for my all. It’s a bit much. Be warned…I did actually break my booty. Kelly Mantoan raps like a BOSS!! from Mary Lenaburg on Vimeo. After this epic moment in my life I found a corner and stayed there with my friend Kathryn for a bit. She saw me coming and just laughed. “You killed it,” she said. “I killed something, possible an eardrum or two and my booty to boot.” was my not so delicate answer. I will not even begin to describe the fact that the sweat was pouring and I looked like a drowned rat. Thankfully the water came back on that night. Thank you Jesus! Just keeping it real my friends. There might also have been a conversation at dinner with an editor from Ave Maria Press (Thanks Heather for the intro) that may require a book proposal from me. There may have been an offer or two to speak at future women’s conferences as well as a few other surprises I look forward to sharing with you in the coming months. There you have it. Edel rocked. Hallie and Jen, and their team, did a phenomenal job and I am so very blessed that I could attend. Thank you to the women who contributed anonymously to make this weekend possible for me. I cannot fully express my gratitude but know, you have changed the course of my daily life and I am just so indebted to you. Thank you to the women of Edel. Thank you for your welcoming spirit, your openness and authenticity, cocktail recs, your humor and wicked dance moves. A weekend I will not soon forget. You DID kill it, Mary. I loved every moment we had together last weekend. Your family is a gift to so many people. YOU JUST DON'T EVEN KNOW. Sorry, had to yell to get your attention. Many hugs and sweet tea vodkas are being raised for you. Hugs from Tejas! Oh my friend, you have no idea what a gift you are to me!! Thank you for talking me down and sitting with me in my grief. You are just grace in motion, with or without crutches. Hugs from NoVa. Ok girlie, that simply rocked!!!! Seeing you sing and dance made me laugh, not at you but with you. I applaud you!!!!!! You are too kind Miss Shauna. I did have fun. That's for sure. This post. This post is what Edel is about. Shut. It. Down. I love you!!! LOL! YOU my friend are an insane awesome grace filled vessel of the Lord sent to make me laugh my a** off this weekend. I am just so happy He brought us together. Shut.It.Down. LOL! Your "are you serious, there is no water face" is priceless and it was sentiments exactly! 🙂 I loved watching you sing your karaoke! You were awesome! I was dancing, singing, clapping, and smiling with you! It was great to meet you and I'm so glad Edel was so wonderful for you! And that is exciting about a possible book and speaking engagements! You and Courtney continue to touch many lives, including mine! Thank you and God bless you always! My husband still laughs at that face. I mean it was a pretty dire situation, don't you think? In the end, all was well. After all it is Edel. Good grief Mary, I don't know if I can handle any more of God's big plans for me!!! Loved meeting you! Next time, we do a duet. Oh my friend. He is just getting started. Just you wait. It's gonna be awesome!! At least you got up there and killed it! That's a million times better than me who is seriously too shy to attempt it. No pride my friend. It helps. LOL! Mary, I don't even know the song you did, but it was HILARIOUS!!!!! Love. It's better you don't know Jeannie. It was a horrid rendition. LOL!